Today I have another sound machine review to share. This time it is the Homedics Deep Sleep Renewal sound machine. Read on for my thoughts, and the thoughts of others, on this sleek and modern sleep aid. With 12 different white noise options, this Homedics sound machine is a versatile wonder! 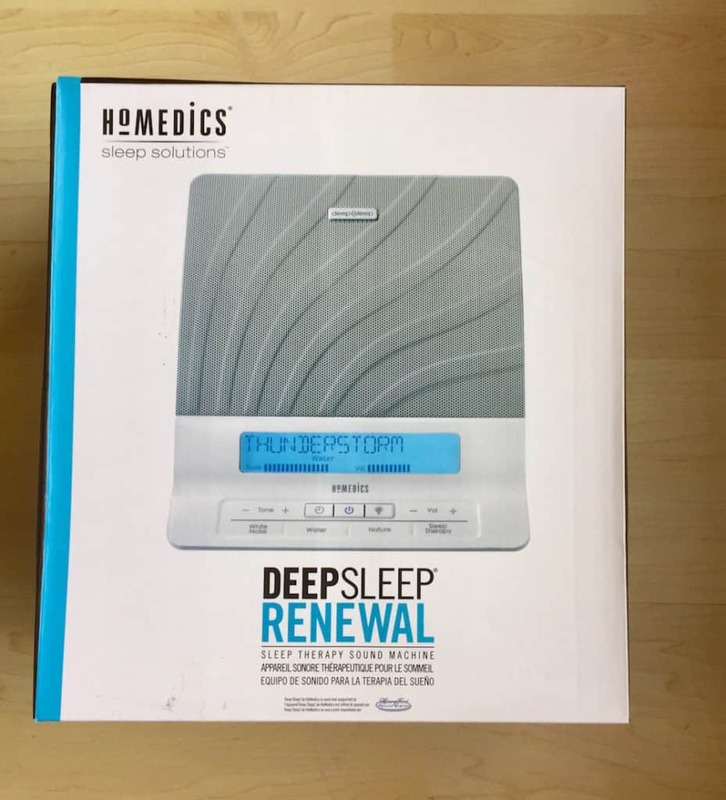 The Homedics Deep Sleep Renewal sound machine includes 8 “scientifically engineered sleep therapy programs” and 12 white noise sounds, a 30, 60, or 90 minute timer, a reverse LCD display with dimmer, dual high performance speakers and a remote control. It includes an AC adaptor but requires batteries to operate the remote control. This machine comes with a limited 1 year warranty. This has by far been the most visually compelling sound machine for my aesthetic. Though larger than the others I have reviewed, its appearance is modern and streamlined. 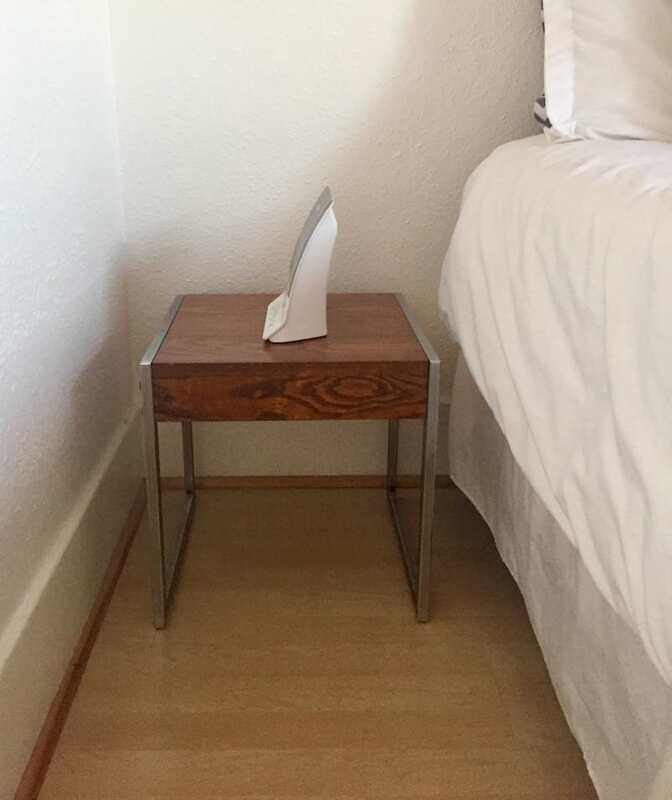 Yes, it may take up more space, but the key (for me) is that I don’t mind it sitting on my nightstand. The speaker is prominent, the buttons are not and the LCD display is subdued, needless to say, I appreciate the balance in this design. The Homedics sound machine includes a significant number of sound options and sound mixes to help you get your best night’s sleep. Here is a rundown of the 3 sound categories and the 12 available noises that fall under each category, plus the sleep therapy programs. Before I start I should say that the quality of these noises is impressive and they flow into each other seamlessly. The dual high performance speakers do their tricks and ensure the sound quality will be difficult to rival. Sound Category Number 1: White Noise – This includes tones soothe, mask, relax and calm. Sound Category Number 2: Water – This includes tones oceans, brook, thunderstorm and rain. Sound Category Number 3: Nature – This includes tones summer night, campfire, wind chimes and everglades. Essentially you choose your favorite relaxation-inducing sound to lull you to sleep, and not long after you fall asleep the sound will transition to white noise to help keep you stay asleep. One caveat of the sleep therapy mode is that it is supposed to run all night, so using the timer is not an option. 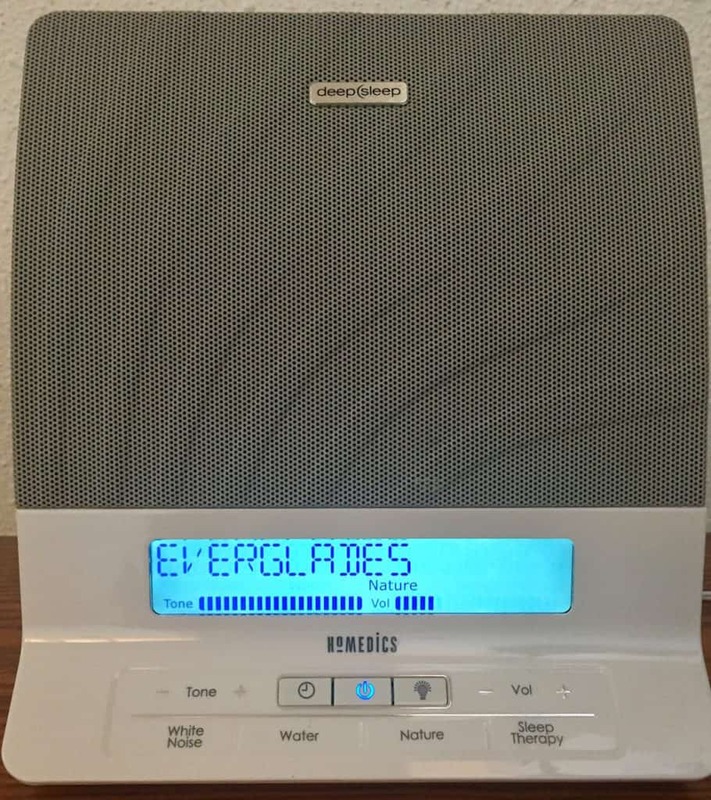 Sound Therapy: Layers any of the 8 nature and water sounds available (oceans, brook, thunderstorm, rain, summer night, campfire, wind chimes and everglades) with the white noise. Looking for a sound machine? Check out my best sound machine page for top picks! While pleasing in appearance, this is the least intuitive sound machine I have tried thus far. 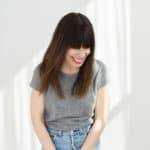 I can admittedly be easily frustrated when something is easy to navigate from the start, but I did have to do some additional research on how to use the sound therapy feature. That said, once I did my homework it was not difficult. After plugging in the machine and selecting the power button, you choose your “sound category”, and then push that button to scroll through all the sounds available in said category. If you only need the one sound, you can adjust the volume via the + and -. To use the timer, just hit the timer button to see a 30, 60, or 90 appear in the upper right corner of the screen. The sound will then stay on for the duration. To utilize the sound therapy feature, you have to hit the “Sleep Therapy” button, and then choose one of the 8 aforementioned sounds of your choice. It will start as soon as the initial noise is selected. Since the goal of this feature is to help you sleep through the night, as mentioned, the timer is not available for this mode. I was immediately intrigued by the Deep Sleep Renewal sound machine. A sucker for form, almost to a fault, I like the look of this sleek and modern model. However, the size is a bit larger, something my husband was not easily able to overlook. It took a little time and energy to figure out the Homedics Deep Sleep Renewal sound machine, not that I am opposed to breaking out the directions. With extra bells and whistles often comes extra research. That said, I would reserve this recommendation for the more technologically savvy of customers, or you might find yourself getting requests for set-up assistance from your parents, in-laws or grandparents. A larger investment than previous models reviewed, the average cost of the Homedics Deep Sleep Relaxation Sound and White Noise Machine Retail is $80 on both Amazon and Bed, Bath and Beyond. It is readily available on both channels and comes with mixed consumer reviews. 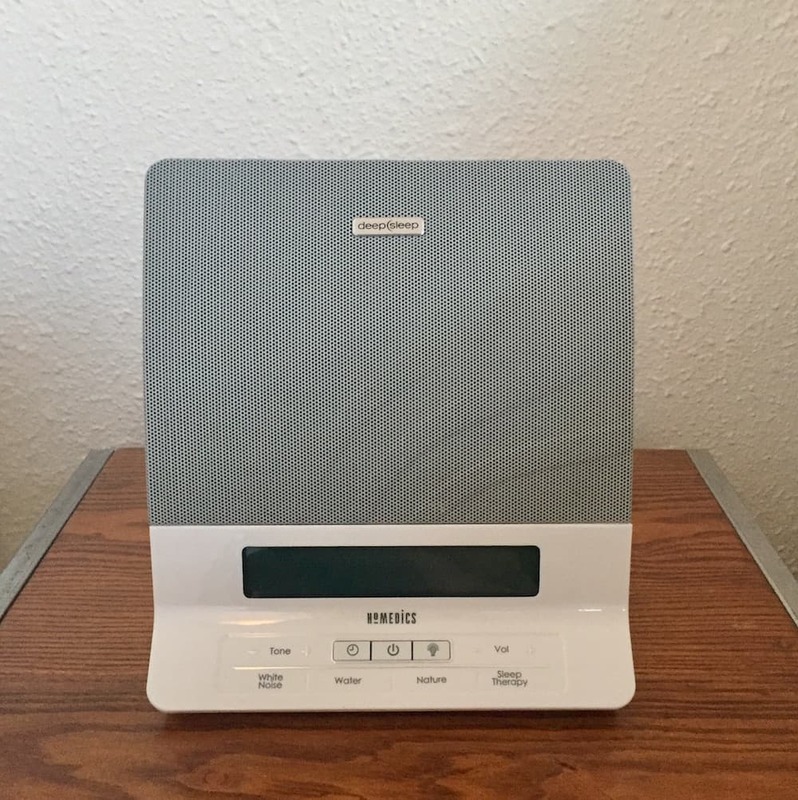 The Homedics Deep Sleep Renewal Sleep Therapy Machine has some hard-core devotees and an equal about of luke-warm to sometimes frustrated users. I tend to fall in the camp of the first reviewer, the sound quality far outweighs any learning curve with the use of the machine. However, one common complaint I discovered is the inconsistency of the machine in both sound and stability. There were many reviewers complaining of technical quirks like the one listed below. “I am not very happy with this product especially when in relation to its price. Soon after purchase, some of the sounds started to have a large pause between it’s looped sound program. This means when I’m listening to the ocean and it reaches the end of its play track, instead of starting The soundtrack over very quickly so that there’s no gap in the sound, it would take about 5 to 7 seconds before it restarted the sound again. This completely defeated the purpose of having a sound machine and made it quite irritating to use. This didn’t happen on all of the tracks so I just decided to go ahead and find a different track or a different sound of that I liked. The issue is starting to spread to other tracks and other sounds so this posit starting to infiltrate all of this sounds at this point . While not an issue I have faced, many who did purchase this machine complained of it not working well and/or stopping altogether. A few were even on their second or third machine in hopes of finding one that will work to their liking. Let me be honest, I so wanted this sound machine to be “the one”. I loved the looks of it, the sound quality and the sleep therapy approach (though I have personally yet to try it). 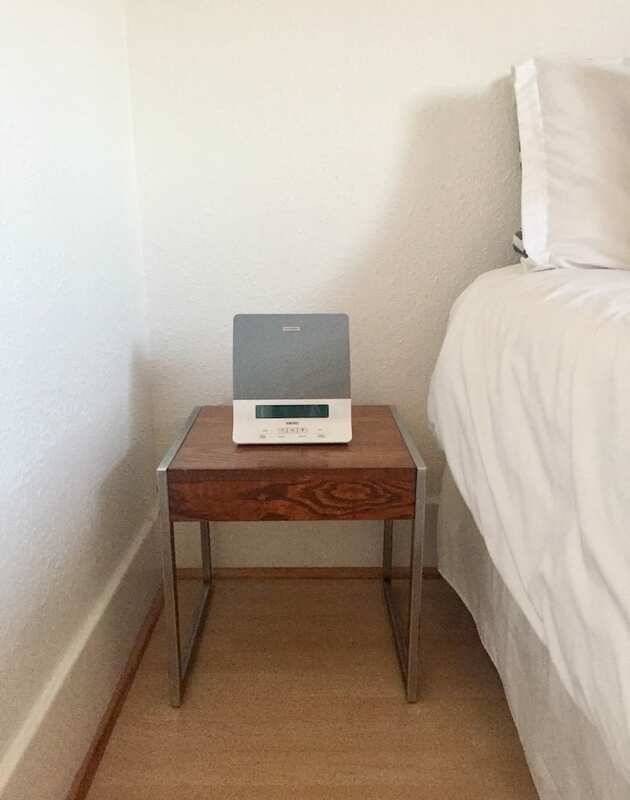 I will hold on to the Homedics Deep Sleep Renewal sound machine and use it as long as the machine will last, or until my husband tires of my monopolizing his nightstand (I need mine for books!). However, this is not something I would necessarily gift or recommend for someone who does not consider themselves technologically savvy, as I fear it too much of an investment of money and time.